Pickled Pirate! : National Margarita Day! If you need an excuse to sip on one of the nation's favorite cocktails, than here it is. Today, February 22nd, is National Margarita Day! Made of tequila, triple sec and lemon/lime juice, the margarita is a well-known beverage that many people think of as their "vacation drink". Jimmy Buffett spoke of this concoction in his hit song, "Margaritaville", and this drink has become just as much a part of the tropics as palm trees and parrots. 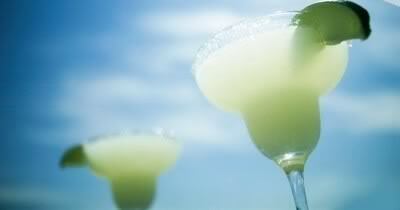 Although the history of the margarita is not well known, it has been around since the early 30s. Over the years it has grown in popularity, making tequila one of the most popular drinks in the United States! Today, there are endless varieties on the traditional Margarita. One of my favorites is the Blue Margarita, which is: 2 oz. tequila, 1 oz. Blue Curacao, 1 oz. triple sec, and 1 oz. lime juice. Not only is this a beautiful drink that reminds me of a sunset on the blue tropical waters, but it tastes great too! When I prefer to buy a pre-mixed version, my favorite is Jose Cuervo Gold, with Grand Marnier. It's really smooth and better than a lot of the restaurant versions. The purpose of National Margarita Day 2011 is to simply enjoy this popular cocktail! That's not hard to do, and it's your choice if you choose to drink it on the rocks or frozen, with or without salt. Celebrate the day in the privacy of your own home, out with friends, or at your favorite local "wet spot". Whatever way you choose is up to you, but don't let the day go by without having a margarita .. or two, or three. It's your duty!